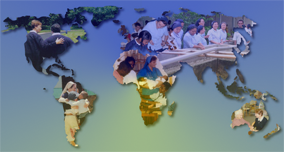 Visit this link for a complete listing of Vincentian Family groups, by country of origin and year founded. Note: This page covers where we serve today. For heritage places, visit this link. For all worldwide locations, go to the AIC International Map. For associations in the United States, go to the LCUSA Map. this link at the International website of the Daughters of Charity. (Click on any of the continents for further details and contact information). The JMV has around 200,000 members in 80 countries around the world. For an organizational chart, visit this link. For information on the United States branch, visit this link. Vincentian Lay Missionaries International, USA are men and women ages 21-35 who feel called to spend 4-6 weeks serving the poor while working alongside the Daughters of Charity in Africa. VLM live with or near the Daughters of Charity or the Vincentian Priests at all sites. For worldwide organization and contact information, visit this link.